The deployment of 5G and the improvements it delivers in the areas of data throughput, edge computing, ultra-low latency, and efficiency is now imminent. While the investment case for 3G and 4G technologies were fueled by staggering cell phone adoption rates and corresponding demand for data capacity by net new users across the globe, the case for investment in 5G adds compelling opportunities and new value chain opportunities. The challenge, for any operator considering this switch, will be choosing the use cases, verticals, and eco-systems where they can rightfully play a meaningful role. Vertiv has performed significant research into edge computing to support the development of edge infrastructure solutions, including those used in telecom sites. This led to the identification of our edge archetypes that bring clarity to the complex edge landscape. 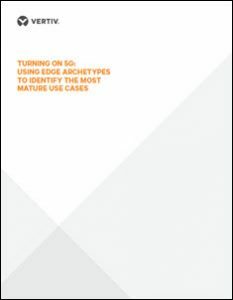 These four archetypes are characterized primarily by their bandwidth and latency requirements—both key drivers of these next-gen networks.